Take a look at 5 amazing step by step tutorial videos of Indian hairstyles. Life can’t get any easier than this! Getting ready to go for a party? Want to try out this amazing outfit but you are not sure because the hair isn’t sorted? Life of a woman can get really complicated if she is pretty sure of how she wants to look but her makeup is not in order or the wardrobe gives up on her or perhaps she is having a bad hair day! Clothes and makeup can be handled, thanks to Zuri for all the amazing posts done in the past that talk about gorgeous makeup tips and outfit ideas, but this one post is going to particularly talk about hairstyles. So, if you are looking for an apt casual, party wear or a bridal hairstyle for a fun evening, formal occasion, job interview or a wedding, then go on, take a look at this post. 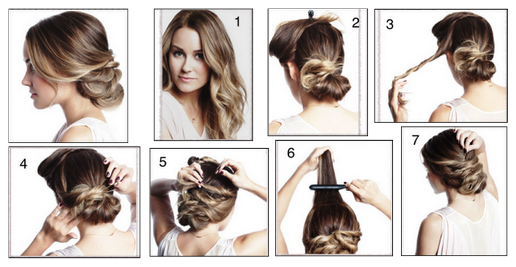 Presenting to you 5 easy-to-do, step by step video tutorials on Indian hairstyles. Stylish, modern, trendy and ultra-cool hairstyles that can be done on long, short as well as medium length hair. Here are 5 amazing videos that are bound to give your usual, boring hairdo a stylish twist. Try them out with a western outfit, a short dress, or an Indian outfit, a Pakistani salwar kameez, an Anarkali maybe, a lehenga, lehenga-saree or a designer saree. 1. Day-to-night wedding look: Now, say goodbye to straight-ironed hair or curlers. I mean, I know, it’s quite tough to try out anything other than these 2 styles, especially when it’s about our great Indian tresses (read volume and complex texture). With the wedding season around the corner and on certain dates, our calendar might read ‘chock-a-block, as-in ‘multiple events to attend’, so here is what you got do. Check out this video to get ideas on how to look different for a day and a night occasion without having to do much. The basic foundation of both the hairstyles/looks is based on one simple trick. 3. Awesome twists to your regular ponytail: Take your ponytail to another level. From a regular high or a low ponytail to a chic hairstyle in just a jiffy. Infact, this one hairstyle sees a number of variations. But only if you knew how to wear one in style and make it your statement hairstyle. Here, watch this highly-recommended video and try out these styles to work, post-work party or perhaps when hitting the gym. Besides, a ponytail is such a versatile hairstyle that it can be tried out on any hair texture, length and volume. Yes! It suits curly hair too! 4. Two ultimate looks for the festive season: Indian festive season is around the corner. This includes Navratri, Karwa Chauth, Diwali, Bhai Dooj, and the great Indian wedding season. This means we need to have atleast 6-7 looks handy. Afterall, it’s all about dressing your best and also having your makeup and hair in place. Gone are the days when we used to pair our Indian outfits with neat hair buns or keep them open or maybe just about side-pin them. This video demonstrates the trendiest and over-dramatic hairdos that are ideal for the upcoming festivals. 5. Top 3 cute hairstyles for short hair: Now that we have discussed at length about long hair, here is something for those who might have felt a bit left out. I am talking about gorgeous ladies with short hair. This hairstyle video is all about three cute, really easy-to-do and simple hairstyles for short-length hair. Just a suggestion- keep hair clips and pins ready because you will need a plentiful of them. Also, a nice (maybe an embellished) hair band as well.